Two-stage compressor is equiped for energy saving, reducing life-cycle cost and improving eliability. 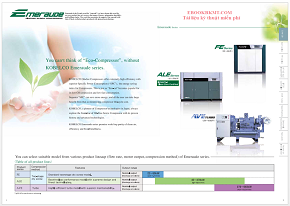 It can achieve 9～34% higher efficiency compared with single-stage oil-free screw compressor. In the Emeraude-FE series, the cooling fan is also controlled by the inverter to further save energy. Reviewing the total cooling system including design of coolers and cooling fan with safety margin, the compressor can operate even under ambient temperature of 45oC.